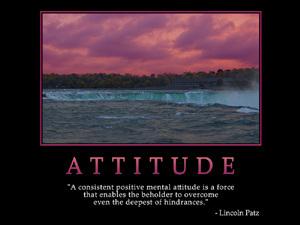 I’ve come to realize that my attitude will dictate every result I get in my life. I’m sure you heard this message too growing up. Things like; if you had a better attitude, you could get better grades in school, or, with an attitude like that you can go to your room, right? The only thing is no one ever told us how to get a better attitude. What is attitude anyway? Well the dictionary describes it as; 1.A position of the body or manner of carrying oneself, indicative of mood or condition. 2. A state of mind or feeling with regard to some matter. 3. A way of behaving; disposition. In other words, my thoughts, feelings, and actions must all be aligned in a positive way, in order for me to be perceived and received as authentic. When this happens, I will radiate with confidence. This entry was posted on Friday, January 1st, 2010 at 8:09 pm and is filed under Uncategorized. You can follow any responses to this entry through the RSS 2.0 feed. You can leave a response, or trackback from your own site.